HCA Relaunches PastTimes Newsletter! 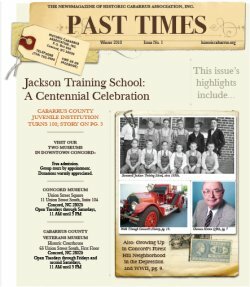 | Historic Cabarrus Association, Inc.
After a several year hiatus, Historic Cabarrus Association, Inc. is pleased to announce that we are re-releasing our Past Times Newsletter! Members will receive a copy of the newsletter by mail. Non-members can access a PDF version of the newsletter via our website. Check out the link below to see what’s happening at Historic Cabarrus Association, Inc.